Join JUSTWIN IT SOLUTIONS for highly professional training for Quality Assurance Software Testing. Our Job Placement Success Rate is nearly 100% because of our fully job-oriented training program from a mentor who will always motivate you and keep you focused for your goal. JUSTWIN IT Solutions is the only institute in GTA who offers Project based IT Training to its candidates. Our course is designed to ensure that you will be able to sustain in your job. Here, we provide fully job-oriented training with the the simulation of real work environment. We promise to support you, and push you to learn, grow and become what you’ve always wanted to be. 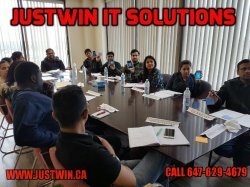 JUSTWIN IT Solutions is the only institute in GTA who offers Project based IT Training to its candidates. Our course is designed to ensure that you will be able to sustain in your job. Here, we provide fully job-oriented training with the the simulation of real work environment. We promise to support you, and push you to learn, grow and become what you’ve always wanted to be. JUSTWIN IT SOLUTIONS is the only institute that is into the direct partnership with a Recruitment Consultancy, called JOBSMONT (www.jobsmont.com) which will enhance your chances by 70% to line up interviews directly with the clients. Our special ‘Interview Preparation’ and ‘Job Interview Skills Training’ will certainly help you to crack the interview in first attempt. JUSTWIN provides end to end support to get you a career. We conduct training during weekend classes, evening batch classes and fast track training classes. WHY STUDENTS JOIN OUR PROGRAM? Getting you a job will be or mutual goal and we expect your 100% dedication. Register yourself today and kick start your career in IT. Call us at 647-629-4679 to book an appointment for career guidance and Job placement. Call us to book an appointment for free career consultation at 647-629-4679.